3. 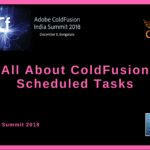 ColdFusion: Champion of IoT and Blockchain? But why use blockchain with CF? How is that relevant? 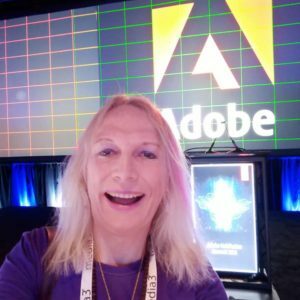 Why is Tech Changing So Fast and How I can Keep Up? and CFML. These newest advancements in our platform and language make me ask:. How can we keep up with all this tech change? Have you ever looked towards the future curious to what may be in store? Of course. We all have. mathematics. Certainly, computers and associated software could not exist. Now, as you can imagine, some of these ideas have not happened. others… well, they’re pretty spot on. primary form of communication between individuals. But one prediction from Toward the Year 2018 affects us as IT professionals and CIOs more than anything. to make our world bigger, faster, and stronger. And we as CF developers are right in the thick of it all. Yes. Tech evolution can be a problem. But only if you let it. The advancement of technologies is a double-edged sword. But on the flip side… They can cause you hang ups and setbacks. current technologies, we will get left behind. Plain and simple. that newest version? (To be honest, I kinda miss that old dial-up connect sound sometimes…) Point is that you would have been left behind. Just a blip on the radar and no more. our faults necessarily. Technology is just changing at an unprecedented rate. It may seem like each and every day, we need to change just to stay current. 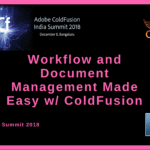 Let’s take a look at 3 MAJOR changes to Adobe ColdFusion in just the past 5 years alone. Virtual Machines of the 1990s. There are 4 primary choices of hosting. Shared hosting is like a hostel dormitory. You share a room with all the other people. If someone gets drunk and throws up on the bunk bed, you have a problem. A managed server is like an apartment complex where there are other apartments but they are walled off from each other. A dedicated machine is like having a detached house – you have to furnish it and fix the faucet when it leaks. Still some work, but you don’t have to worry about your bed being vomited on. Cloud hosting is like having a virtual dedicated house – one that you can instantly clone for more space when a horde of out of town guests arrive. The cloud and cloud technologies are also lending a hand to one of CF’s hottest new advancements. Containerization. Building modernized apps is a crucial task for the future. Here soon legacy CF apps will be rendered near useless with the growth of both CF and integrated technologies. This particular sequence becomes exceedingly useful in software development. Especially when it comes to testing. Using a modern testing environment is critical to software engineering (and keeping CF alive). Use portable testing environments — such as CF Builder— as well. The benefit to using portable environments is making the reuse of the development environment configuration much easier. The lack of a mature testing environment can lead to absolute chaos during the run-up to deploying new code. Agile testing plans include many different types of testing avenues including TDD and more notably BDD. According to the 2018 State of the CF Union, 44% of CFers polled do not automate or use CI deployment tools. If you are not automating your builds, you are missing out on saving time and improving your deployment and testing process. However, for those who use CI tools, Jenkins seems to be the most popular tool of choice. Tom Soderstrom, IT Chief Technology Officer for NASA’s Jet Propulsion Laboratory, believes these changes in DevOps are the possibly the biggest changes we have been experiencing recently. Related: Is Control Better than Speed for your ColdFusion Apps? world. But what actually is it? The Internet of things (IoT) is the network of devices, vehicles, and home appliances that contain electronics, software, actuators, and connectivity which allows these things to connect, interact and exchange data. You probably have some smart objects. We have desktop computers, laptops, smartphones, even smartwatches. But a smart lamp? Or just a smart light bulb? Let’s call these lamps and light bulbs “dumb” objects. Now, what if we could take these dumb things and make them smart? How neat would that be? But as many of you know, this is already happening. Through technologies such as Amazon Alexa and Echo devices or Apple HomeKit, modern homes are being transformed into those found only in science fiction novels. This concept is the Internet of Things. And we as CF developers are playing a part in its creation. 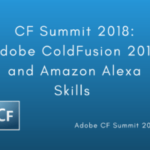 At the 2017 CFCamp in Munich, Evagoras Charalambous gave a presentation on the foundation of using ColdFusion to build Alexa skills. He focused first on defining your app on the Amazon Development Portal. Next, he discussed how to make the skill talk to your ColdFusion code. He provided a sample CF project for the user to take away and use to develop their own app. 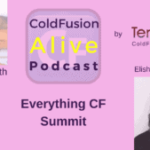 This was not the end of IoT in ColdFusion however. 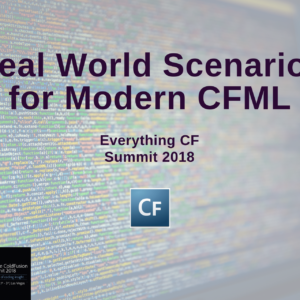 The topic stuck like like glue and made another major showing at this year’s 2018 CF Summit in Las Vegas. This time Mike Callahan covered everything from consuming utterances, intents, and slots. Attendees also walked away with a custom framework and all the information needed to start constructing Alexa skills. issues. Some believe that these can be alleviated via Blockchain. bullet for IoT issues, but blockchains do offer hope. Mike Brunt breaks down blockchains in one of my podcasts. One of his biggest reasons for using blockchain with CF is that Blockchain uses RESTful API technology. As we all know (or should for that matter), building RESTful APIs is a breeze with ColdFusion– particularly when using Ortus Solution’s ColdBox MVC. The growth and capacity of digital devices are just bonkers. In a previous world-changing industrial revolution, growth was measured on an arithmetic scale. A scale that shows a constant linear growth. Yet, the digital era is breaking traditional laws. Growth can only be fathomed on geometric scales. On these scales, the constant factor is no longer added year after year. Instead, the factor is now multiplied! In order to even show this progress linearly, logarithmic functions must be incorporated. This digital revolution is not only surpassing traditional laws but creating new ones. Moore’s Law illustrates the effects of technical progress of microprocessors. Moore’s Law is named after Intel co-founder Gordon Moore. As you can see, tech is not moving one step at a time. It is moving in leaps and bounds. This can be explained by three separate conditions. development of new concepts of modularization, substitution, and adaptation techniques. development is actually consumer driven. People always want bigger and better things. tech 5 years from now will be very close to the supercomputers of today. Needless to say… keeping literal pace is actually impossible. With so many changes and upgrades available, how do you even know where to begin? Check out this survey conducted by TechTarget. They polled nearly 300 IT professionals– including CIOs and IT chiefs– regarding the IT Priorities of 2018. These are just some recommendation priorities from other IT pros, but they are pretty good rules to follow. Funny thing is that this also applies specifically to our wants and desires as CF developers. When polling CF’ers prior to the release of CF 2018, Rakshith Naresh found that 71% of everyone polled wanted NETWORK PERFORMANCE UPGRADES. 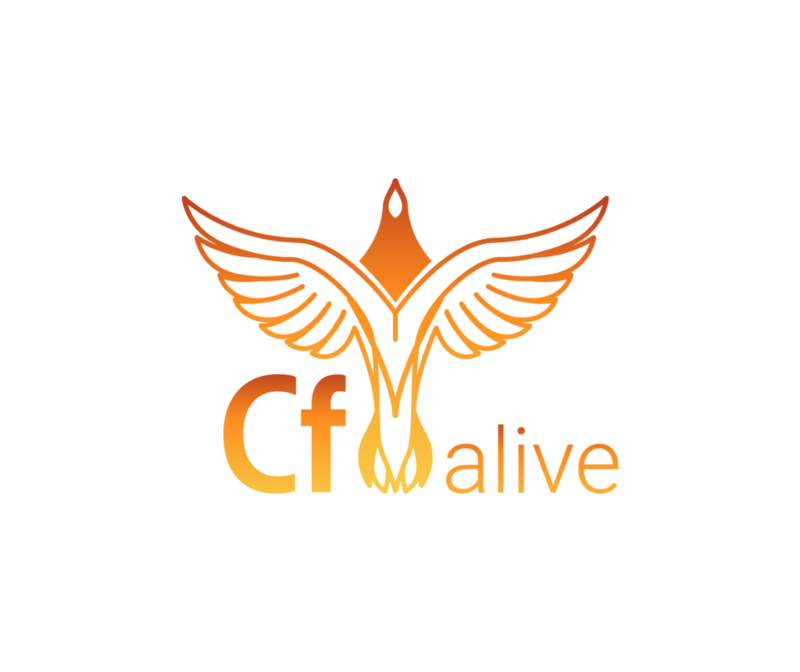 When they applied these changes in the release of CF2018, many of these performance upgrades were implemented through IT AUTOMATION–i.e. The Auto Security Lockdown feature and Performance Monitoring Toolkit. Security was not mentioned directly on this list though. 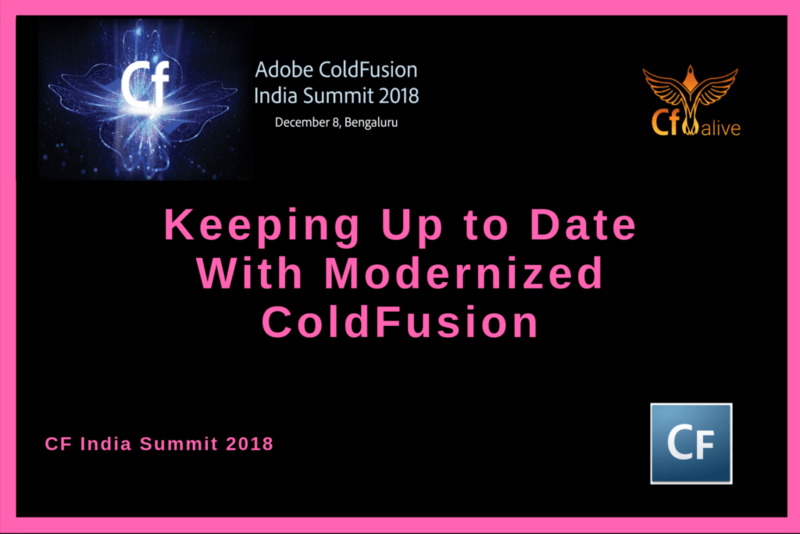 Security, however, is often worked into the other priorities as you can clearly see with ColdFusion 2018. So, keeping your network up to date actually will help prevent security concerns. This is important as security threats often evolve just as fast as the tech they affect. In all reality, we have no way of knowing. Perhaps, a true AI lies just around the corner in wait. Maybe a grand unified programming language? Either way, how are we supposed to keep up with it? There’s only one could answer to that question. We do the best we can. architecture of software components. At leisure, he likes traveling, badminton and music. listening to light music and reading experiences on Quora. the New Performance Monitoring Toolset in CF 2018! Elasticsearch and Machine Learning. In free time, he loves to read/watch news, cricket and Indian politics. she is currently part of, and Acrobat. Her area of expertise is developing web applications and automation. daughter, she finds time to nurture her creative skills. She is an avid yoga follower as well.